Lisa Lichtenfels is one of my first dollmaking friends. When I met her in 1985, I wanted to study with her. She wouldn’t travel, but I finally convinced her to hold a seminar for myself and several other students in her own home. That was the beginning of the Dollmaker’s Community College that held several seminars with master dollmakers in my basement in Point Pleasant, NJ. Later, I extended the idea as a way for some of the NIADA artists to pay for their trip to the NIADA convention, and eventually the idea of dollmaking seminars caught on resulting in all the dollmaking conventions continuing until this day. Lisa has work in museums, and has a second book coming out soon. She has a show at the CFM Gallery, 236 West 27th Street running from April 1 – 30, 2011. The following review appeared in GALLERY&STUDIO APRIL/MAY 2011, and is reprinted with the encouragement of Neil Zukerman, CFM Gallery. Surely new standards for art world hype were set last year, when private art dealer Philippe Ségalot hired celebrity hair stylist Frederic Fekkai to style the wig on Italian artist Maurizio Cattelan’s hyperrealist sculpture of model/actress Stephanie Seymour before it was photographed for the cover of an auction catalog. That Fekkai happens to be the real Stephanie Seymour’s hair dresser, of course, only adds to the absurdity of a work of art being primped as if for the Academy Awards. Long before Cattelan made news with his gussied-up efﬁgy, the American fabric sculptor Lisa Lichtenfels created 3-D portraits of Barbra Streisand and Demi Moore so eerily lifelike as to quicken the hearts of their most rabid fans, even while displaying all the formal attributes of enduring art. And, thankfully, Lichtenfels’ dealer Neil Zukerman, of Chelsea’s CFM Gallery, feels no need to resort to such tactics to promote his charge, since Lichtenfels’ sculptures succeed splendidly on their own artistic merits. That Lichtenfels transcends the People magazine mentality of Cattelan and others who pander to the disposable values of celebrity culture is made especially clear in her sculpture “Lon Chaney,” depicting the silent screen star whose best known characterization, “The Phantom of the Opera,” demonstrated his artistry as a makeup artist as well as an actor. 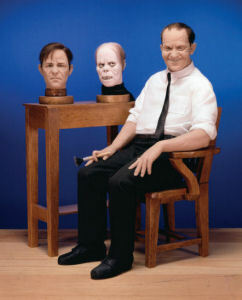 Indeed, her portrait pays tribute to “The Man of a Thousand Faces” primarily as a fellow visual artist, showing him seated and holding a make-up brush like a cigar, beside the somewhat gruesome-looking models for two of his characters, propped up on his workbench like severed heads. Commenting affectionately on the piece in the text of the exhibition catalog, the sculptor evokes something of Norman Rockwell’s Americana when she likens the actor to her engineer father, saying, “Both had very rough lives but forged honorable careers. They were both of a certain generation of men. Then again, several things set Lichtenfels’ work apart from that of other hyperrealist sculptors of recent vintage. For one, her ﬁgures are created from scratch, rather than cast from living people in the manner of George Segal or Duane Hanson, which gives them a subjective expressive dimension that probes beyond surface appearances. For another, most of her contemporaries use polyurethane, fiberglass, resin and other unyielding materials to create figures they then paint over as a mortician might apply cosmetics to a rigor-mortised corpse, which gives them an embalmed appearance. By contrast, Lichtenfels employs the novel and more malleable medium of nylon stockings, which she wraps around a moveable internal skeleton to give her personages a more supple human quality.